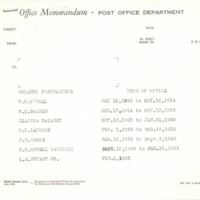 A memorandum from the U.S. Post Office Department listing the names and terms of service of postmasters for Orlando, Florida, from 1898 1951. The postmasters included W. R. O'Neal, 1898 to 1914; W. C. McLean, 1914 to 1923; Claudia DeLaney, 1923 to 1930; D. R. Laycock, 1930 to 1935; James D. Beggs, Jr., 1935 to 1949; D. H. Howell, 1949 to 1951; and Lucius A. Bryant, Jr. (ca. 1919-2012), 1951 to 1983. Bryant was the postmaster at the time that this list was compiled. After serving in the U.S. Army during World War II, Bryant settled in Orlando's College Park neighborhood. At the time of his death in 2012, Bryant was the longest-serving postmaster for Orlando, a position that he held from 1951 to 1983. In 1952, William Hamer Beardall, Jr. (1890-1984) appointed Bryant to the local aviation advisory board, which he served on for 22 years. Original memorandum: Private Collection of Texann Ivy Buck. Tracy, Dan. "Lucius 'Jim' Bryant: Former Orlando postmaster was civic-minded." The Orlando Sentinel, August 6, 2012. http://articles.orlandosentinel.com/2012-08-06/news/os-obit-bryant-20120806_1_orlando-sentinel-orlando-international-airport-greg-ethington. 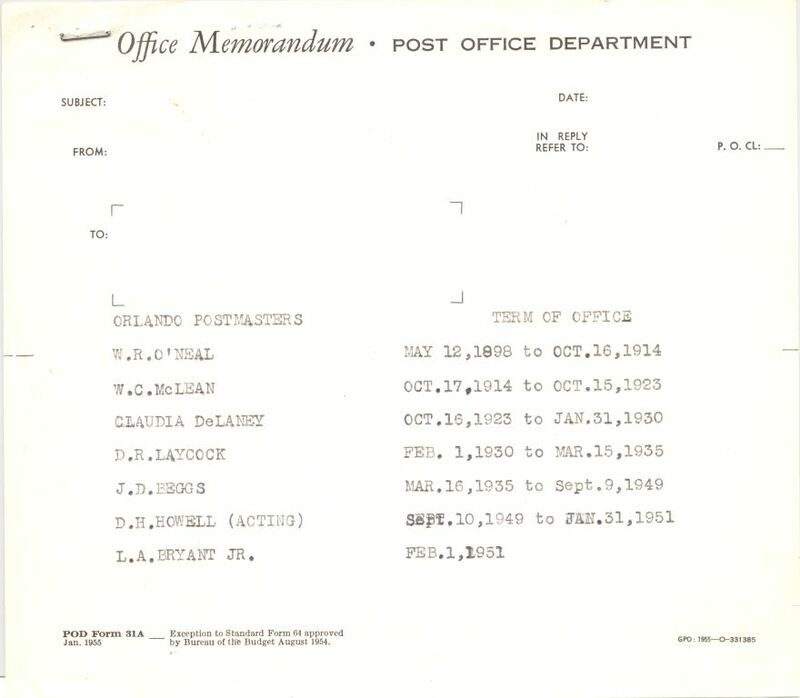 “Orlando's Postmasters and Terms of Office, 1898 to 1951.” RICHES of Central Florida accessed April 18, 2019, https://richesmi.cah.ucf.edu/omeka/items/show/7602.